Me? I'm not a drooler. I'm the assistant. I don't know what Miss Jones or Miss Kelsey could do without me. There are fifty-five low-grade droolers in this ward, and how could they ever all be fed if I wasn't around? I like to feed droolers. They don't make trouble. They can't. Something's wrong with most of their legs and arms, and they can't talk. They're very low-grade. I can walk, and talk, and do things. You must be careful with the droolers and not feed them too fast. Then they choke. Miss Jones says I'm an expert. When a new nurse comes I show her how to do it. It's funny watching a new nurse try to feed them. She goes at it so slow and careful that supper time would be around before she finished shoving down their breakfast. Then I show her, because I'm an expert. Dr. Dalrymple says I am, and he ought to know. A drooler can eat twice as fast if you know how to make him. My name's Tom. I'm twenty-eight years old. Everybody knows me in the institution. This is an institution, you know. It belongs to the State of California and is run by politics. I know. I've been here a long time. Everybody trusts me. I run errands all over the place, when I'm not busy with the droolers. I like droolers. It makes me think how lucky I am that I ain't a drooler. I like it here in the Home. I don't like the outside. I know. I've been around a bit, and run away, and adopted. Me for the Home, and for the drooling ward best of all. I don't look like a drooler, do I? You can tell the difference soon as you look at me. I'm an assistant, expert assistant. That's going some for a feeb. Feeb? Oh, that's feeble-minded. I thought you knew. We're all feebs in here. But I'm a high-grade feeb. Dr. Dalrymple says I'm too smart to be in the Home, but I never let on. It's a pretty good place. And don't throw fits like lots of the feebs. You see that house up there through the trees. The high-grade epilecs all live in it by themselves. They're stuck up because they ain't just ordinary feebs. They call it the club house, and they say they're just as good as anybody outside, only they're sick. I don't like them much. They laugh at me, when they ain't busy throwing fits. But I don't care. I never have to be scared about falling down and busting my head. Sometimes they run around in circles trying to find a place to sit down quick, only they don't. Low-grade epilecs are disgusting, and high-grade epilecs put on airs. I'm glad I ain't an epilec. There ain't anything to them. They just talk big, that's all. Miss Kelsey says I talk too much. But I talk sense, and that's more than the other feebs do. Dr. Dalrymple says I have the gift of language. I know it. You ought to hear me talk when I'm by myself, or when I've got a drooler to listen. Sometimes I think I'd like to be a politician, only it's too much trouble. They're all great talkers; that's how they hold their jobs. Nobody's crazy in this institution. They're just feeble in their minds. Let me tell you something funny. There's about a dozen high-grade girls that set the tables in the big dining room. Sometimes when they're done ahead of time, they all sit down in chairs in a circle and talk. I sneak up to the door and listen, and I nearly die to keep from laughing. Do you want to know what they talk? It's like this. They don't say a word for a long time. And then one says, "Thank God I'm not feeble-minded." And all the rest nod their heads and look pleased. And then nobody says anything for a time. After which the next girl in the circle says, "Thank God I'm not feeble-minded," and they nod their heads all over again. And it goes on around the circle, and they never say anything else. Now they're real feebs, ain't they? I leave it to you. I'm not that kind of a feeb, thank God. Sometimes I don't think I'm a feeb at all. I play in the band and read music. We're all supposed to be feebs in the band except the leader. He's crazy. We know it, but we never talk about it except amongst ourselves. His job is politics, too, and we don't want him to lose it. I play the drum. They can't get along without me in this institution. I was sick once, so I know. It's a wonder the drooling ward didn't break down while I was in hospital. I could get out of here if I wanted to. I'm not so feeble as some might think. But I don't let on. I have too good a time. Besides, everything would run down if I went away. I'm afraid some time they'll find out I'm not a feeb and send me out into the world to earn my own living. I know the world, and I don't like it. The Home is fine enough for me. You see how I grin sometimes. I can't help that. But I can put it on a lot. I'm not bad, though. I look at myself in the glass. My mouth is funny, I know that, and it lops down, and my teeth are bad. You can tell a feeb anywhere by looking at his mouth and teeth. But that doesn't prove I'm a feeb. It's just because I'm lucky that I look like one. I know a lot. If I told you all I know, you'd be surprised. But when I don't want to know, or when they want me to do something don't want to do, I just let my mouth lop down and laugh and make foolish noises. I watch the foolish noises made by the low-grades, and I can fool anybody. And I know a lot of foolish noises. Miss Kelsey called me a fool the other day. She was very angry, and that was where I fooled her. Miss Kelsey asked me once why I don't write a book about feebs. I was telling her what was the matter with little Albert. He's a drooler, you know, and I can always tell the way he twists his left eye what's the matter with him. So I was explaining it to Miss Kelsey, and, because she didn't know, it made her mad. But some day, mebbe, I'll write that book. Only it's so much trouble. Besides, I'd sooner talk. Do you know what a micro is? It's the kind with the little heads no bigger than your fist. They're usually droolers, and they live a long time. The hydros don't drool. They have the big heads, and they're smarter. But they never grow up. They always die. I never look at one without thinking he's going to die. Sometimes, when I'm feeling lazy, or the nurse is mad at me, I wish I was a drooler with nothing to do and somebody to feed me. But I guess I'd sooner talk and be what I am. Only yesterday Doctor Dalrymple said to me, "Tom," he said, "just don't know what I'd do without you." And he ought to know, seeing as he's had the bossing of a thousand feebs for going on two years. Dr. Whatcomb was before him. They get appointed, you know. It's politics. I've seen a whole lot of doctors here in my time. I was here before any of them. I've been in this institution twenty-five years. No, I've got no complaints. The institution couldn't be run better. It's a snap to be a high-grade feeb. Just look at Doctor Dalrymple. He has troubles. He holds his job by politics. You bet we high-graders talk politics. We know all about it, and it's bad. An institution like this oughtn't to be run on politics. Look at Doctor Dalrymple. He's been here two years and learned a lot. Then politics will come along and throw him out and send a new doctor who don't know anything about feebs. I've been acquainted with just thousands of nurses in my time. Some of them are nice. But they come and go. Most of the women get married. Sometimes I think I'd like to get married. I spoke to Dr. Whatcomb about it once, but he told me he was very sorry, because feebs ain't allowed to get married. I've been in love. She was a nurse. Won't tell you her name. She had blue eyes, and yellow hair, and a kind voice, and she liked me. She told me so. And she always told me to be a good boy. And I was, too, until afterward, and then I ran away. You see, she went off and got married, and she didn't tell me about it. I guess being married ain't what it's cracked up to be. Dr. Anglin and his wife used to fight. I've seen them. And once I heard her call him a feeb. Now nobody has a right to call anybody a feeb that ain't. Dr. Anglin got awful mad when she called him that. But he didn't last long. Politics drove him out, and Doctor Mandeville came. He didn't have a wife. I heard him talking one time with the engineer. The engineer and his wife fought like cats and dogs, and that day Doctor Mandeville told him he was damn glad he wasn't tied to no petticoats. A petticoat is a skirt. I knew what he meant, if I was a feeb. But never let on. You hear lots when you don't let on. I've seen a lot in my time. Once I was adopted, and went away on the railroad over forty miles to live with a man named Peter Bopp and his wife. They had a ranch. Doctor Anglin said I was strong and bright, and I said I was, too. That was because I wanted to be adopted. And Peter Bopp said he'd give me a good home, and the lawyers fixed up the papers. But I soon made up my mind that a ranch was no place for me. Mrs. Bopp was scared to death of me and wouldn't let me sleep in the house. They fixed up the woodshed and made me sleep there. had to get up at four o'clock and feed the horses, and milk cows, and carry the milk to the neighbours. They called it chores, but it kept me going all day. I chopped wood, and cleaned chicken houses, and weeded vegetables, and did most everything on the place. I never had any fun. I hadn't no time. Let me tell you one thing. I'd sooner feed mush and milk to feebs than milk cows with the frost on the ground. Mrs. Bopp was scared to let me play with her children. And I was scared, too. They used to make faces at me when nobody was looking, and call me "Looney." Everybody called me Looney Tom. And the other boys in the neighbourhood threw rocks at me. You never see anything like that in the Home here. The feebs are better behaved. Mrs. Bopp used to pinch me and pull my hair when she thought was too slow, and I only made foolish noises and went slower. She said I'd be the death of her some day. I left the boards off the old well in the pasture, and the pretty new calf fell in and got drowned. Then Peter Bopp said he was going to give me a licking. He did, too. He took a strap halter and went at me. It was awful. I'd never had a licking in my life. They don't do such things in the Home, which is why I say the Home is the place for me. I know the law, and I knew he had no right to lick me with a strap halter. That was being cruel, and the guardianship papers said he mustn't be cruel. I didn't say anything. I just waited, which shows you what kind of a feeb I am. I waited a long time, and got slower, and made more foolish noises; but he wouldn't send me back to the Home, which was what I wanted. But one day, it was the first of the month, Mrs. Brown gave me three dollars, which was for her milk bill with Peter Bopp. That was in the morning. When I brought the milk in the evening I was to bring back the receipt. But I didn't. I just walked down to the station, bought a ticket like any one, and rode on the train back to the Home. That's the kind of a feeb I am. Doctor Anglin was gone then, and Doctor Mandeville had his place. I walked right into his office. He didn't know me. "Hello," he said, "this ain't visiting day." "I ain't a visitor," I said. "I'm Tom. I belong here." Then he whistled and showed he was surprised. I told him all about it, and showed him the marks of the strap halter, and he got madder and madder all the time and said he'd attend to Mr. Peter Bopp's case. And mebbe you think some of them little droolers weren't glad to see me. I walked right into the ward. There was a new nurse feeding little Albert. "Hold on," I said. "That ain't the way. Don't you see how he's twisting that left eye? Let me show you." Mebbe she thought was a new doctor, for she just gave me the spoon, and I guess I filled little Albert up with the most comfortable meal he'd had since I went away. Droolers ain't bad when you understand them. I heard Miss Jones tell Miss Kelsey once that I had an amazing gift in handling droolers. Some day, mebbe, I'm going to talk with Doctor Dalrymple and get him to give me a declaration that I ain't a feeb. Then I'll get him to make me a real assistant in the drooling ward, with forty dollars a month and my board. And then I'll marry Miss Jones and live right on here. And if she won't have me, I'll marry Miss Kelsey or some other nurse. There's lots of them that want to get married. And I won't care if my wife gets mad and calls me a feeb. What's the good? And I guess when one's learned to put up with droolers a wife won't be much worse. I didn't tell you about when I ran away. I hadn't no idea of such a thing, and it was Charley and Joe who put me up to it. They're high-grade epilecs, you know. I'd been up to Doctor Wilson's office with a message, and was going back to the drooling ward, when I saw Charley and Joe hiding around the corner of the gymnasium and making motions to me. I went over to them. "Hello," Joe said. "How's droolers?" "Fine," I said. "Had any fits lately?" That made them mad, and I was going on, when Joe said, "We're running away. Come on." "We're going up over the top of the mountain," Joe said. "And find a gold mine," said Charley. "We don't have fits any more. We're cured." "All right," I said. And we sneaked around back of the gymnasium and in among the trees. Mebbe we walked along about ten minutes, when I stopped. "What's the matter?" said Joe. "Wait," I said. "I got to go back." And I said, "To get little Albert." And they said I couldn't, and got mad. But I didn't care. knew they'd wait. You see, I've been here twenty-five years, and I know the back trails that lead up the mountain, and Charley and Joe didn't know those trails. That's why they wanted me to come. So I went back and got little Albert. He can't walk, or talk, or do anything except drool, and I had to carry him in my arms. We went on past the last hayfield, which was as far as I'd ever gone. Then the woods and brush got so thick, and me not finding any more trail, we followed the cow-path down to a big creek and crawled through the fence which showed where the Home land stopped. We climbed up the big hill on the other side of the creek. It was all big trees, and no brush, but it was so steep and slippery with dead leaves we could hardly walk. By and by we came to a real bad place. It was forty feet across, and if you slipped you'd fall a thousand feet, or mebbe a hundred. Anyway, you wouldn't fall -- just slide. I went across first, carrying little Albert. Joe came next. But Charley got scared right in the middle and sat down. "I'm going to have a fit," he said. "No, you're not," said Joe. "Because if you was you wouldn't 'a' sat down. You take all your fits standing." "This is a different kind of a fit," said Charley, beginning to cry. He shook and shook, but just because he wanted to he couldn't scare up the least kind of a fit. Joe got mad and used awful language. But that didn't help none. So I talked soft and kind to Charley. That's the way to handle feebs. If you get mad, they get worse. I know. I'm that way myself. That's why I was almost the death of Mrs. Bopp. She got mad. "Here, stop your cussing and hold Albert. I'll go back and get him." And I did, too; but he was so scared and dizzy he crawled along on hands and knees while I helped him. When I got him across and took Albert back in my arms, I heard somebody laugh and looked down. And there was a man and woman on horseback looking up at us. He had a gun on his saddle, and it was her who was laughing. "Who in hell's that?" said Joe, getting scared. "Somebody to catch us?" "Shut up your cussing," I said to him. "That is the man who owns this ranch and writes books." "How do you do, Mr. Endicott," I said down to him. "Hello," he said. "What are you doing here?" "We're running away," I said. And he said, "Good luck. But be sure and get back before dark." "But this is a real running away," I said. And then both he and his wife laughed. "All right," he said. "Good luck just the same. But watch out the bears and mountain lions don't get you when it gets dark." Then they rode away laughing, pleasant like; but I wished he hadn't said that about the bears and mountain lions. After we got around the hill, I found a trail, and we went much faster. Charley didn't have any more signs of fits, and began laughing and talking about gold mines. The trouble was with little Albert. He was almost as big as me. You see, all the time I'd been calling him little Albert, he'd been growing up. He was so heavy I couldn't keep up with Joe and Charley. I was all out of breath. So I told them they'd have to take turns in carrying him, which they said they wouldn't. Then I said I'd leave them and they'd get lost, and the mountain lions and bears would eat them. Charley looked like he was going to have a fit right there, and Joe said, "Give him to me." And after that we carried him in turn. We kept right on up that mountain. I don't think there was any gold mine, but we might 'a' got to the top and found it, if we hadn't lost the trail, and if it hadn't got dark, and if little Albert hadn't tired us all out carrying him. Lots of feebs are scared of the dark, and Joe said he was going to have a fit right there. Only he didn't. I never saw such an unlucky boy. He never could throw a fit when he wanted to. Some of the feebs can throw fits as quick as a wink. By and by it got real black, and we were hungry, and we didn't have no fire. You see, they don't let feebs carry matches, and all we could do was just shiver. And we'd never thought about being hungry. You see, feebs always have their food ready for them, and that's why it's better to be a feeb than earning your living in the world. And worse than everything was the quiet. There was only one thing worse, and it was the noises. There was all kinds of noises every once in a while, with quiet spells in between. I reckon they were rabbits, but they made noises in the brush like wild animals -- you know, rustle rustle, thump, bump, crackle crackle, just like that. First Charley got a fit, a real one, and Joe threw a terrible one. I don't mind fits in the Home with everybody around. But out in the woods on a dark night is different. You listen to me, and never go hunting gold mines with epilecs, even if they are high-grade. I never had such an awful night. When Joe and Charley weren't throwing fits they were making believe, and in the darkness the shivers from the cold which I couldn't see seemed like fits, too. And I shivered so hard I thought I was getting fits myself. And little Albert, with nothing to eat, just drooled and drooled. I never seen him as bad as that before. Why, he twisted that left eye of his until it ought to have dropped out. I couldn't see it, but I could tell from the movements he made. And Joe just lay and cussed and cussed, and Charley cried and wished he was back in the Home. We didn't die, and next morning we went right back the way we'd come. And little Albert got awful heavy. Doctor Wilson was mad as could be, and said I was the worst feeb in the institution, along with Joe and Charley. But Miss Striker, who was a nurse in the drooling ward then, just put her arms around me and cried, she was that happy I'd got back. I thought right there that mebbe I'd marry her. But only a month afterward she got married to the plumber that came up from the city to fix the gutter-pipes of the new hospital. And little Albert never twisted his eye for two days, it was that tired. Next time I run away I'm going right over that mountain. But I ain't going to take epilecs along. They ain't never cured, and when they get scared or excited they throw fits to beat the band. But I'll take little Albert. Somehow I can't get along without him. And, anyway, I ain't going to run away. 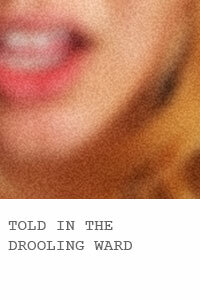 The drooling ward's a better snap than gold mines, and I hear there's a new nurse coming. Besides, little Albert's bigger than I am now, and I could never carry him over a mountain. And he's growing bigger every day. It's astonishing. Dr Ragin is honest and intelligent but lacks the strength of character to see to it that life around him is honest and intelligent - which has serious consequences for the psyciatric ward he runs.